Brunswick Machine Knitting Novices: The only reference you'll ever need? The only reference you'll ever need? Well, I couldn't possibly presume to tell you what you should prefer, but this is my present favourite reference. It crept up on me gradually. I bought it from Reynolds in Sydney, along with a few other books. I must have thought it looked promising, but it did languish forgotten for a while. But every now and then I'd look to clarify some technique or other, and find it useful. It proved to be particularly useful when I was roped in the demonstrate "Punch Lace", I was honoured in this way on the strength of having discovered, by accident, that 1x1 punch lace is an excellent way to add a depth and texture to an otherwise plain knit surface. The notes on Punch Lace in this book proved to be a most satisfactory basis for a comprehensive demonstration. Once I noticed what a treasure I had, I wanted to find out some more about this woman. You can read about her life here Finding Regine . As I see it, these are the elements that make this book so valuable here, and now. It is written for the 24 stitch repeat punch card machine, specifically the Singer punch card machine. The machine a would be machine knitter is most likely to find in Melbourne. It is written for the basic flat bed machine, without ribber or other accessories. Every technique discussed can be performed without any ancillary specialised equipment. Regine herself was not familiar with knitting machines when asked to set up a tertiary machine knitting course. Her expertise was in knitwear design. With the aid of a Singer technician, she kept one class ahead of her students. The beginner level of expertise dominates. 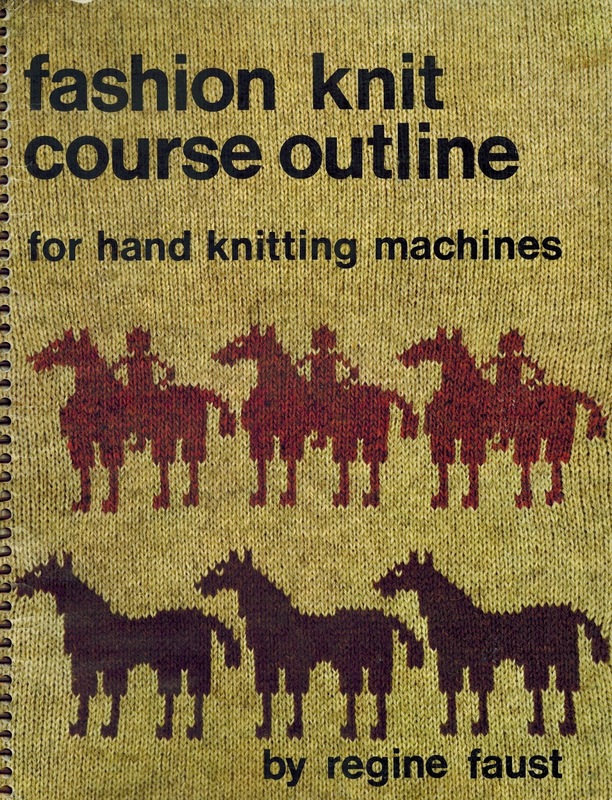 Although the book is not visually inspiring, apparently being a compilation of typed class notes, it is the work of a knitwear designer, focussing on the design implications of all the techniques explained. 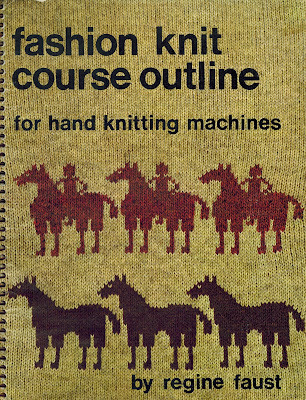 A brisk work through this book would constitute a solid foundation in machine knitting. Those class notes are valuable lesson plans. Never thought you would use Punch Lace?